One would think that colleges are the hub for all things digital. With millennials running the campuses, it comes as a surprise that most academic processes are done via good old-fashioned print forms. But it's true. Whether it be transferring majors or requesting a class override, most modern-day campuses still resort to print documents for any and all formal requests. Just take one step into a college registrar's office and we bet that you will find some sort of cubby contraption filled with a hundred different documents and their corresponding labels. Colleges present a great market for print distributors because these print products are highly repeatable and in constant demand. Not to mention the fact that most items prominently display some sort of logo. Just think, the print demand for diplomas during graduation time alone is a high-revenue, high-volume job. A single university can house over 50,000 undergraduates, according to U.S. News. The potential in the college market is huge.To help understand the true volume of print forms required by various college departments we have created a list of common campus forms and their functions. For the sake of brevity, we will be focusing specifically on academic forms. The most obvious forms for college campuses involve academics. When it comes to class requests, colleges keep the relevant forms on files. Here are some examples of important academic documents that can be found on any college campus. Level restriction override: This form is for students looking to surpass current class restrictions. Some college courses have a set of requirements for enrollment. Most colleges require certain specifications to allow a student to override these restrictions. For example, Ithaca College mandates that students requesting to pass level requirements have a GPA of 3.0 or higher. The form includes areas for course information, an explanation of why the request is being made and the relevant signatures. Part-Time enrollment/over enrollment: Most colleges have qualifications for full-time and part-time students. For example, a part time student could be anyone who enrolls in classes worth fewer than 12 credits, full-time students are 12 or above and over-enrollment begins with anything more than 18 credits. In order to clarify your enrollment level with the registrar's office, you must fill out a form indicating a switch. This form includes areas for clarification on whether you will be part-time or over-enrolled, GPA, major, credits and the courses intended for enrollment. Depending on the school this form could be a single document or two separate documents. Pass/Fail request forms (SDF): Whether a university labels this Pass/Fail or Satisfactory/D/Fail, the intent of the form is the same. Students are allowed to enroll in certain courses without the pressure of varying grades. Grades C or above are a pass, anything below is considered a fail. The major difference lies in the 'D' option, in SDF systems a D or below is factored into a student's GPA. A satisfactory grade has no bearing. This form identifies the student making the request, the student ID number, the course that the student is requesting for this option and signatures from varying levels of authority. Add/Drop forms: In every college, there is a period called "add/drop." During this limited time frame students are allowed to either add or drop courses from their term schedule. The process requires varying levels of approval. For example, Boston College requires students requesting an add/drop to get the signature of the associate dean and sometimes a department head. The form also includes specifications about which course the student is requesting to add or drop, as well as what semester and academic year. Audit forms: Audit forms are requests for students to sit in on a class without receiving a grade. Most colleges encourage this type of participation as it fosters a sense of learning for the love of learning as opposed to a GPA boost. While there is no real grade assigned to students who audit a course, students still must apply in order to ensure there is capacity in the classroom. The form requires approval from the faculty member teaching the course, as well as information regarding the student's major, GPA and student ID number. Some schools require the signature of higher level officials such as the Dean or Associate Dean. Many colleges also provide clarification regarding auditing expectations at the bottom of the form. Course waiver forms: For almost every major a college has to offer there is a list of required courses. While the level of requirements may vary by major, there are specifications specific to every area of study. There are often courses that students may have taken before or during abroad excursions that can substitute for certain requirements. This is the reason for course waiver forms. 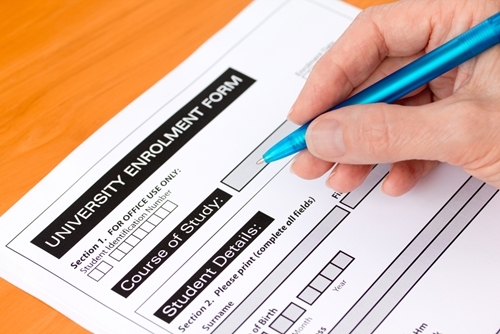 These forms allow students to substitute a relevant course for a major or minor requirement. This form requires students to specify which course they are substituting, why they are substituting it and then mandates relevant signature requirements.